This is #3 in the Archer and Bennett series by Candice Fox and it is as dark, violent, quirky and outstanding as her first two highly awarded thrillers. There is a strange bond between Detective Frank Bennett and his partner Detective Eden Archer. Maybe it is because Frank is damaged because he had seen his girlfriend murdered or because Eden volunteered to go underground to trap a couple of serial killers who had slit her open from her sternum to navel. However, the strongest bond is because Frank knows that Eden is also a serial killer, who hunts down and kills whatever lowlife she finds, in a kind of Robyn Hood role. It is also because Frank knows and has worked for Eden's "father" Hades Archer who brought her up in a world where he is a body disposal expert using his own garbage tip. Eden is still recovering physically and is now able to get around with only one crutch. Their first case when they get back to work is a couple of gruesome murders of night-time joggers in Sydney's public parks. The killings look very personal with violent destruction of the victims' faces. There is great public interest in the killings and there is a race to find the killer before he/she strikes again. Frank is dating Imogen, the psychologist trying to banish his anxieties following his girlfriend's death, who just happens to be a dangerous narcissist. She is especially dangerous because she is digging up the 20-year-old Tanner case and wants to prove that Eden was one of the missing children. Fox also introduces us to another unusual character "Hooky" who is a diminutive young Vietnamese girl recovering from personal tragedy when her sister murdered her parents. She is a genius, dresses as a punk-Japanese-rocker, and has superintelligence which saw her get top honours at University in computing science with an engineering major. Her chosen therapy is to work with the police who investigated her parents' murder and she soon becomes an unofficial but very valuable asset to Frank and Eden, especially in using the dark web to hunt down and identify pedophiles. The scary part is when she meets Hades and Eden on their home turf, at the tip. While the serial killer case is reasonably straightforward, there are a couple of clever endings that come out of left field and will leave you stunned. Candice Fox sprang to fame as an Australian author of very different type of thriller when she released her award-winning debut novel HADES a couple of years ago. Last year she followed up here success with a similarly quirky, dark and violent successor, EDEN. 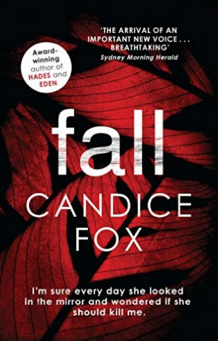 I have been a Candice Fox fan from the beginning and this book certainly caps an outstanding trilogy. There may be a clue to the direction of further​ books which could be stunners. There is no doubt the Candice Fox is one of the most creative authors of Australian crime thrillers. I see that she has landed a co-authorship with James Patterson of a book set in Australia which should help her international reputation. I wish her well with that venture and hope that the Patterson book editing factory doesn't decimate her writing talents to bring them into line with their standards.